The most important thing to remember when dealing with a mail bomb, biological or chemical agent threat: don’t panic. Rash actions can lead to even more harmful consequences. Bombs sent through the mail don’t usually have ticking timers, and biological agents don’t spread rapidly on their own. Isolate the package. Don’t have people gather to look at the package. This procedure holds true for any suspicious package. Don’t “test” the package by shaking it, or tasting a substance. Alert other employees that a suspicious package has been found, and that they should remain clear of the area. Note the specific points that make this package suspicious. Write down all available information from each side of the item (names, addresses, postmarks, labels, markings, etc.). Have someone call 9-1-1. Tell the dispatcher what you’ve received and what you’ve done with it. Also, contact your firm’s security office. Call your local postal inspector. Wash your hands with soap and warm water for one minute. If you suspect a biological agent, don’t allow anyone to leave the office that might have touched the package. When emergency responders arrive, they’ll provide further instructions. Be prepared to answer many questions from the emergency responders. The police and postal inspectors have extensive knowledge of bomb and biological threats. Their questions and your responses will help determine the next steps for handling the threat. 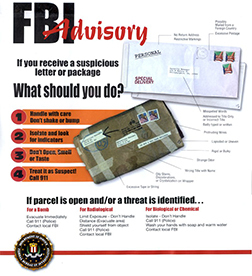 The actions you take during a threat have an immediate impact on the safety of everyone in your mail center. The actions you take before a threat have a lasting impact on the safety of everyone in your company. Preparing your mail center and your employees to handle a threat is an obligation you must meet every day. Education and awareness are the essential ingredients to preparedness. Most people have a fear of the unknown. Information is the counter to ignorance. And understanding is the precursor to calm. However, being calm isn’t the same as being casual. Employees must remain aware of their surroundings and the packages they handle. You must carefully design and vigorously monitor your security program to reduce the risk for all.